The dream began back in February when we set about taking on a challenge to raise money for HAE UK, a charity very personal to my heart & get ourselves fit. 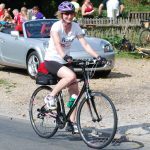 We choose this particular ride as, unlike many other charity events, you could raise money for a charity of your choice; luckily all of my team mates supported me in our cause. Every weekend we cycled, slowly increasing our distance to eventually managing 45 miles, this was coupled with 2 spinning classes a week and the help of a personal trainer. Unfortunately the training hit a setback in July when I was struck down with a bad back and due to reducing my danazol tablets to 1 100mg per week, I was getting plagued with HAE attacks. Very slowly the back improved and I spoke with Dr Longhurst and we agreed to increase my danazol back up to 2 tablets per week. After 7 months of training the day finally arrived. Our team of 3 had increased to 10 keen cyclists. We met at Brockenhurst College, in the New Forest just before 8am on the day of the ride and mentally psyched ourselves up for the long ride ahead. Photos were taken & off we headed. The group stuck together for the first 10 miles and then split up. The 2 young lads James & Elliot sped off ahead, followed by the 2 oldies Rose & Leyon hot on their heels. Not too far behind were Andy & Steve, lagging at the back were Ness, Jo, Carl & Nina. The first 30 miles were a breeze, lovely & flat, this is going to be easy or so we thought!! The second half of the ride was extremely hilly & hard going. Unfortunately Andy suffered a knee injury and had to take the 45 mile route, but courageous Steve plodded on by himself. Sadly disaster came his way too and he injured his leg at the 45 mile point and lay on the side of the road in agony waiting for help to arrive, this never came, so unfortunately he had to call home and get rescued. This was the end of the ride for poor Steve. refreshments and complaining of aching legs, we waiting here for 45 minutes for the rest of our team, but eventually decided to continue without them. Leyon & I were extremely pleased to see the finish line ahead at 62 miles and enjoyed a large coffee and hog roast. We timed our ride at 5 hours & 10 minutes. We sat ourselves down on the grass and waiting for the arrival of the rest of team HAE. An hour and half later they crossed the finish line, coming in at just over 6 hours. An incredible day was had by all, coupled with sore bums & legs. I found social media (predominately) Facebook one of the best sources of raising awareness to my bike ride and continually plugged it over the months leading up to the ride, coupled with a few begging letters to my nearest and dearest and work company contacts. This has been a fantastic year of getting ourselves fit and the feeling of total elation at being able to raise so much money for our wonderful charity HAE UK, coupled with a little sadness in that it was all over.